Welcome to Charlotte’s Original Goat Yoga!! 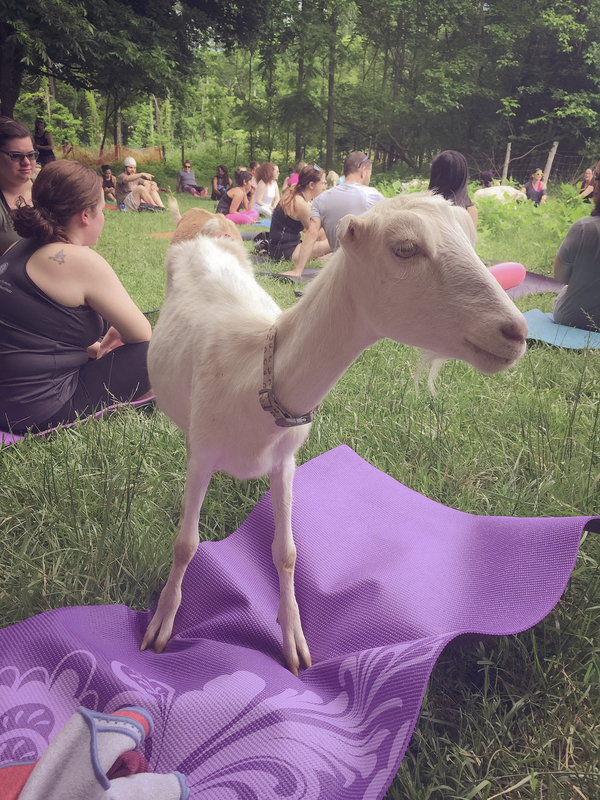 Are you eager to sign up for 2018 Goat Yoga, or know someone who is? To celebrate our third full season of goat yoga, we are offering a limited number of season passes for 2018! The Full Season Pass includes access to all 2018 goat yoga classes (12 total), a bottle of our natural bug spray (refills on the house during the season), a quality farm yoga mat, and 10% off Synergy Yoga regular class passes (excludes new client special). Our goat yoga instructors will offer 10% off their drop-in classes at participating studios. Cherry pick or attend them all, with the full season pass, you can choose your own farm adventure. Have YOU had a chance to do mountain pose next to a goat? Join our social goats in the pasture and bring new meaning to your practice… they love yoga on the farm as much as we do. There is nothing better than goat noses interrupting yoga poses. All farm yoga is laid back and family friendly. Get in some good stretches, take in the fresh air, and snuggle our adorable baby goats! Classes start in April and run through October. Claim your Full Season Pass or pre-register for our first goat yoga class of 2018! As a courtesy to our yogis, we request that you pre-register. Children are welcome! Children over age 12 require individual registration. All children must accompany a registered adult. *NO RESTROOMS available. Please plan accordingly! •Please bring your own yoga mat and water. We will share blankets if they are available, but we don’t have enough for everyone! •Farm bug spray is available for purchase. •Please only plan to attend if you are a registered guest or on staff. If you have special needs, please contact us in advance. We encourage those who can, to carpool as parking is limited. STEELE CREEK FRIENDS we encourage you to ride your bike or walk to the farm. **We do not offer refunds. Unused classes do not roll over into the next season, are non-exchangeable and non-transferable. We do not offer exceptions for cancellations. If we cancel due to extreme weather conditions, we will offer a rain date. Please follow the goat yoga event page on Facebook for last minute weather updates, or contact us directly with questions. If you suspect inclement weather, please dress appropriately, bring an extra towel, blanket or tarp. Class will very likely go ON!